South Creek is the shortest of the three Myrtle Beach National courses, but it offers plenty of challenge to golfers of all levels. The majestic beauty of coastal wetlands and hardwood forests make this a favorite among Myrtle Beach golf courses. The lush fairways wind their way through the beautiful surroundings and lead to immaculate Mini-Verde greens. Accuracy is a premium on South Creek as you navigate through large waste areas, wetlands, lakes and strategic bunkering. There are many dogleg holes that require you to maneuver the ball in both directions. Steep bunkers protect the undulating greens. When visiting the Grand Strand on your next Myrtle Beach golf vacation, South Creek would be the perfect Myrtle Beach golf course to include in your itinerary. 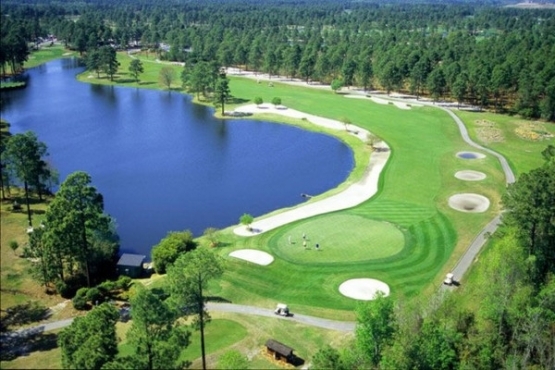 After your round at South Creek you certainly want to take advantage of the many outstanding Myrtle Beach attractions. The Myrtle Beach Boardwalk offers the perfect opportunity to take a stroll and enjoy the beautiful Myrtle Beach weather while taking in the magnificent views of the Atlantic Ocean. Myrtle Beach golf packages are a great way to save money and get the very best in Myrtle Beach golf deals. They also offer the finest Myrtle Beach accommodations. Great golf, great weather and great entertainment are just waiting for you to book your next Myrtle Beach golf package. Book yours today!